Completing graduation is a great step in a graduate’s life. It’s at this stage that a person gets the ability to take decisions, though small, because s/he gains a confidence and of course knowledge s/he has acquired from so many years of schooling. All in all, it’s definitely a moment to celebrate. However, it’s often daunting what to gift to the graduate on the occasion so that s/he will be truly pleased and rejoice even more that s/he is a graduate now. If you’re trapped in such confusion, here are some graduation gift ideas to help you out. 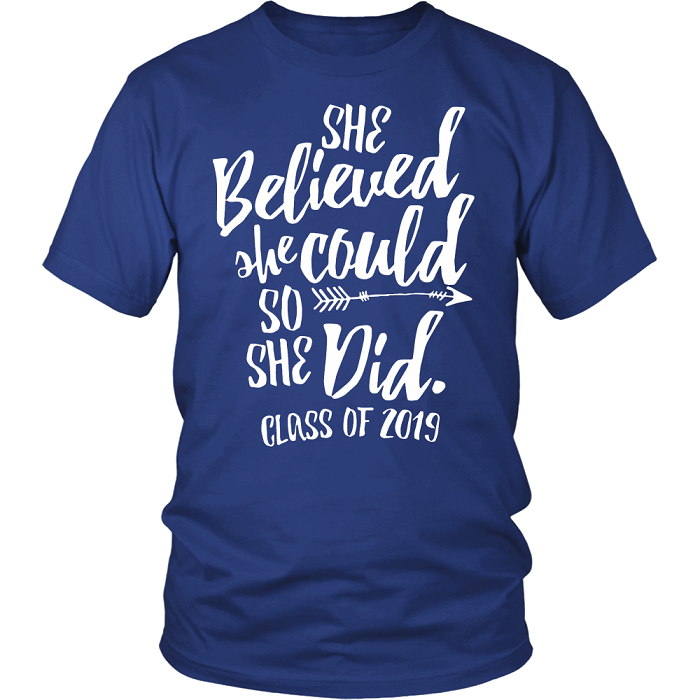 My Class Shop has brought a cool line of class of 2019 shirts with catchy graduation slogans which will definitely appeal your graduate. Take a look at this one, for example. The slogan here is “She Believed she could so she did”. It’s great to encourage your recipient and praise her for her achievement with the perfect words. Some more are “Queens are Graduating”, “Kings are Graduating”, “Sen19ritis – It’s a Real Thing This Should Clear Up by Spring”, “Graduation Makes Me Happy”, “All I Care About is Graduating and Like Three People” and more. They are available in exciting colors and come with a strong construction and material. Gift them to your recipient and see their eyes shining. As such there is no age limit to start making an art collection. But you can help your graduate to start one with some classy pieces of a renowned artist, preferably s/he loves. Choose a small size such as 9×9 inch which s/he can display on an entire wall and feel proud every time looking at them and that will come at a perfect price for you. Pictures are invaluable and should be displayed in a right setting. You can gift beautiful picture frames to your recipient in which s/he can display pictures of their graduation or any other pictures they would love to. Choose frames that come in multiple colors or if you choose metal frames, they may be golden or silver and an embossed pattern to add beauty. If your graduate recipient is an art-lover, you can gift them something with which they can start a new hobby or develop the existing one further. Gift them a calligraphy pen and ink with which they can create beautifully carved messages and get admiration. Follow these tips and celebrate the graduate’s success in a true sense to make them feel proud and happy.